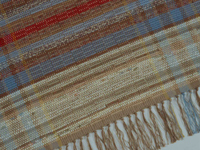 Harriet Giles is an independent studio weaver working in Lexington, Kentucky. Through her company, The Weavery, she designs and directs the production of hand-woven rag rugs in historically inspired designs as well as contemporary ones. 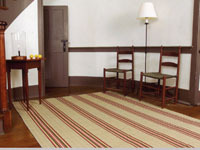 Room-size rugs are the main focus of her work, most of them commissioned on a custom basis. She also produces a line of unique area and throw-size rugs as well as rag totes, placemats, and table runners. 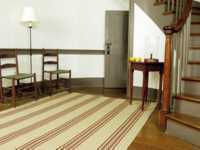 Harriet taught herself to weave when she and her husband lived in a very rural area of Virginia. 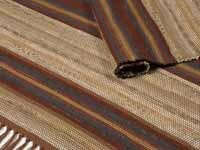 She designs and weaves rugs on wooden hand looms the same way that weavers have done for centuries. She cuts fabric into strips, winds them on shuttles, and weaves them into a groundwork of loom-controlled threads. She creates room-size rugs on a 12-foot-wide loom, the largest one she knows of in the region. Her designs include densely warped bold stripes and dynamic plaids as well as subtle, intricate twills and rep weave. She uses strips of floral and printed fabrics as well as solids to achieve a rich color blend. Manipulating the interaction of color in the warp and weft, she works at a level of sophistication that gives the functional a place in creative interiors. In 1990, Harriet started marketing her work on a national level and grew from having several assistants to a cottage industry of eight. 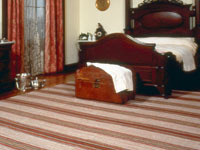 They wove rag rugs and accessories for more than 200 stores, interior designers, and showrooms in the United States in addition to their retail customers. Now Harriet weaves mostly custom rugs with one assistant who has worked with her for sixteen years.